Making sure that the pet bird gets a balanced diet is important, and of equal importance is ensuring they don’t get a chance to eat anything that might be dangerous or poisonous. 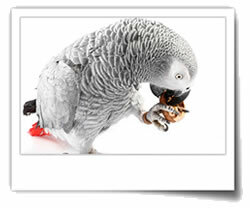 Most companion pet birds are seed eaters. However, seed alone will not provide your bird with the nutrients they require. Manufacturers of prepared bird food will supplement mixes to ensure they get the right nutrients in the right proportions. 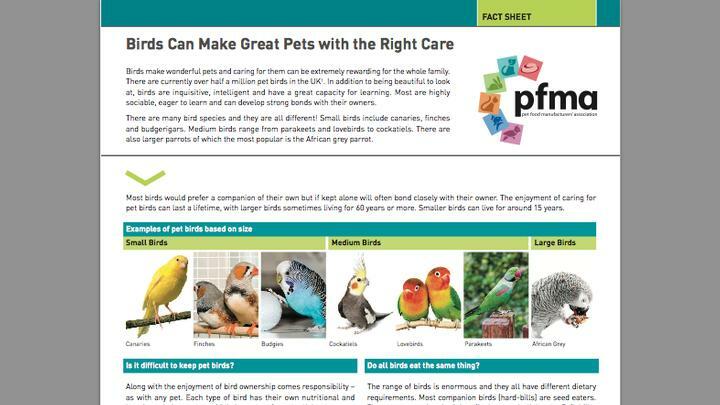 Here are some of our top tips to ensure your pet bird is kept as healthy as possible. In addition to seed, pet birds need iodine, vitamin A and calcium to avoid rickets. The most important essential fatty acid for birds is linoleic acid and deficiencies can cause skin problems and poor feather development. Minerals are very important to birds to maintain bones, claws and beak. They can be provided in the form of mineral blocks, cuttlefish bones or oyster shells. To ensure your bird receives the correct, balanced diet, look for the words "complete feed" on the food packaging. This means that this particular food has been manufactured to provide all the nutrients it needs to keep it healthy. Some birds (parrots and related species) are selective feeders so owners need to take great care not to indulge the bird with its favourite bits of any feed as this could mean he’s no longer receiving a balanced diet. In addition to providing a good quality bird feed, small quantities of fresh fruit and veg may be fed as a treat for your bird, but you should take care not to overdo this as it is an additional source of calories. Always ensure that any fruit or veg given is safe for them to eat and it should be washed thoroughly and cut in to manageable pieces. In the wild, birds eat millet sprays fresh from the branches, and millet sprays can offer both a source of entertainment and a healthy treat for caged birds within the home. Other treats, such as ‘seed sticks’ are also widely available and provide not only nutrition, vitamins and minerals but also are a great source of activity for the birds. As with all additional sources of nutrition, care should be taken to avoid any over feeding of your pet. Small birds such as finches and canaries need to eat as much as 30% of their bodyweight in seed each day. Care should be taken to always ensure that feeders are kept free of husks and that there is always sufficient seed available. During the breeding season when seed eaters are feeding young they may take some higher protein manufactured ‘soft’ foods – many of which are egg based. The protein requirement of birds may also increase during growth, or at moulting time. Softbills tend to be kept by more experienced bird keepers. These bird species have specific nutritional needs, depending on whether they are insectivorous, carnivorous, nectivorous (nectar feeders), frugivorous (fruit eaters), or omnivorous. Always remember, birds need constant access to fresh clean drinking water from a suitable water drinker, available from pet shops. Clean the drinkers every day. Please always follow the feeding guidelines on bird food packaging and make sure your birds have plenty of space to stay active. To find out whether your bird is in a healthy shape please go to our page on bird size-o-meter and watch our video on how to assess your bird's body condition score. Here you can see an alphabetical list of PFMA member companies that produce/supply a wide range of bird food and feeding products for indoor birds. Please refer to their individual websites for more details. Your local pet shop or supermarket is also likely to sell a good range of bird food. If you need any advice, simply ask the retailer – or visit your vet - for tips. Birds can make great pets with the right care. 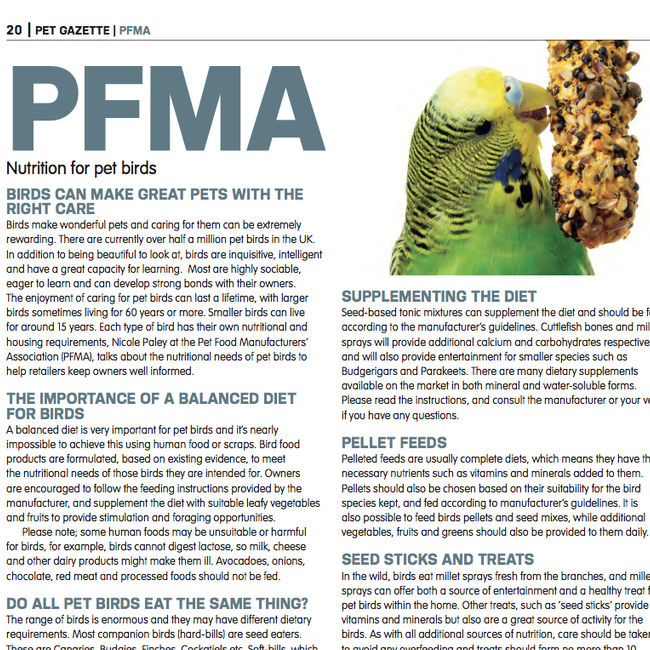 Here PFMA gives lots of advice on how to feed pet birds. Nicole Paley discussed feeding tips for pet birds.